Qualitative RT-PCR has several attributes that make it well suited for initial diagnosis. Bone marrow aspirate and peripheral blood are both suitable and comparable speci-mens,27 obviating the need for frequent invasive procedures, while sensitivity and rapid turnaround facilitate initiation of therapy. Methodologically, qualitative RT-PCR can be performed with a simple, nested, or multiplex approach. However, nested methods are suboptimal due to a significant risk of PCR contamination and consequent false-positive results. With nonnested, simplex RT-PCR, one assay is performed using a single pair of primers. Primers for BCR exon 13 (b2) and ABL1 exon 2 (a2) identify both the e13a2 (b2a2) and e14a2 (b3a2) fusion transcripts that differ in size by 75 base pairs (bp) (Figure 35-5a, lanes 1 and 6, respectively). Using PCR primers to these regions allows for the molecular detection of CML in nearly all cases (~99%); however, variant breakpoints occur. When variant breakpoints fall outside of the region recognized by the primers, a false-negative RT-PCR result occurs, whereas if the variant breakpoints fall within the primer region, an RT-PCR product of unexpected size results. Variant breakpoints are diverse and often complex and cannot be globally assessed with any one pair of PCR primers; however, they are quite rare and are thus not a major cause of false-negative results. The incorporation of an ABL1 exon 3 (a3) primer in place of an exon 2 primer permits the routine detection of rare ABL1 intron 3 breakpoints and has been recom mended by some for routine evaluation.28 However, there have been fewer than ten patients with CML reported with this variant breakpoint, which is similarly rare in ALL. or other myeloproliferative disorders. A positive qualitative result is critical for the diagnosis of CML, particularly in those patients lacking the Philadelphia chromosome on routine karyotypic analysis. 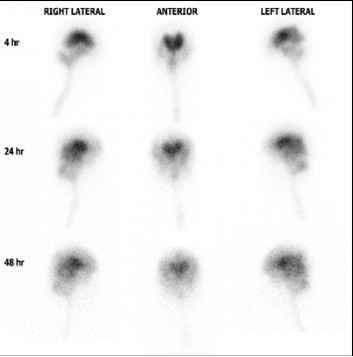 The presence of BCR-ABL1 transcripts validates the implementation of targeted therapy with imatinib mesylate, while identification of the type of fusion transcript that is specific to the neoplastic clone is important for subsequent monitoring. Although the majority of patients with CML possess the e13a2 (b2a2) or e14a2 (b3a2) transcript, identification of the e1a2 or e19a2 forms may explain unusual hematologic phenotypes (Figure 35-2c). Thus, detection of the most common BCR breakpoints (e1, e13, and e14) and the common (a2) as well as variant (a3) breakpoints involving ABL1 can be accomplished with two parallel conventional RT-PCR assays that use BCR-exon 1/ABL1-exon 3 and BCR-exon 13/ABL1-exon 3 primers. 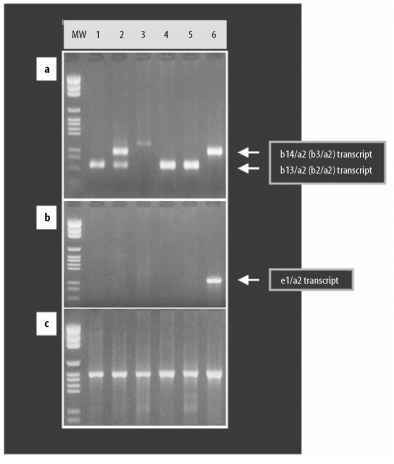 An independent RT-PCR assay for an unrelated mRNA (e.g.,B2M,GAPDH,BCR,or ABL1) is also necessary as a quality control to assess the integrity of the RNA and the presence of RT-PCR inhibitors (Figure 35-5c). These three reactions may be multiplexed to allow for the simultaneous detection of the various transcripts, but multiplexing may reduce the sensitivity of the individual reactions. While reduced sensitivity is not relevant for diagnostic testing, it is very relevant for monitoring residual disease. In addition to its role at diagnosis, qualitative RT-PCR had been the mainstay of minimal residual disease assessment. As noted, however, a single positive (or negative) qualitative result is of little clinical predictive value. Consequently, quantitative RT-PCR has emerged as a preferred modality for posttherapeutic monitoring and has further refined the prognostic significance of standard qualitative results.